A pentagram is a five-pointed figure used as a magical or occult symbol by the Pythagoreans, Masons, Gnostics, Cabalists, magicians, Wiccans, Satanists, etc. There is apparently something attractive about the figure's geometry and proportions. In many symbolizations, the top point represents either the human head or a non-human Spirit. To invert the figure is considered by some as a sign of relegating Spirit to the bottom of the metaphysical heap. Others take inversion to be Satanic and on par with alleged mockeries such as inverting the cross or saying the Mass backwards. Still others find nothing particularly diabolical about inversion and use the inverted pentagram without fear of accidentally invoking the forces of evil. Some say the pentagram is mystical because 5 is mystical. It's a prime number, the sum of 2 and 3, as well as of 1 and 4. Jesus had five wounds, they say, if you don't count those inflicted by the crown of thorns; and he distributed five loaves of bread to five thousand people. Most importantly, we have five fingers, toes and senses. To the Wiccan, the five points of the pentagram represent Air, Fire, Water, Earth and Spirit. Wiccans usually put the symbol in a circle, which has traditionally represented the endless or eternity. The ancient Chinese believed there were five elements (wood, fire, earth, metal, and water), five planets, five seasons, five senses, as well as five basic colors, sounds and tastes. However, the number six seems to have been more enchanting to them than five, for the I Ching uses six as its base number. So does the Star of David, which has six points and is made by overlapping two equilateral triangles. The Star of David is a hexagram but is not used to cast a hex on you. That kind of hex comes from the German word for witch, Hexen, which is related to the Old High German word hagzissa, a hag. Occultists of all sorts wear pentagram talismans to protect them from evil or to help them get occult knowledge and power. They even draw pentagrams on the ground and stand within them to better call upon occult powers. If the point is aimed north, they are not worshippers of Satan. However, if the point is aimed south, they are. So say the Christian watchdogs. 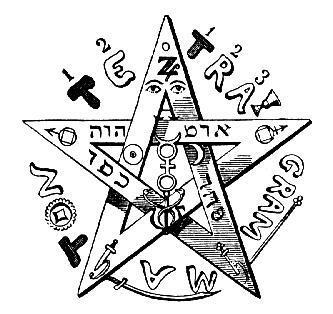 For some reason, the pentagram has become the symbol for a star, though no star in the sky looks like a pentagram, unless perhaps it is seen from inside the five corners of the earth when one is five sheets to the wind. Furthermore, some mystics claim that if one stares at a small pentangle long enough one will see that all triangles end in a circle with five sides.